Don’t look now, but the opening weekend of the 2019 USL Championship season is just six short weeks away. Players across the league’s 36 teams have already started to report to preseason training camps and some sides will play exhibition matches as early as this evening – looking at you El Paso Locomotive FC and Rio Grande Valley FC. As they gear up for the biggest regular season in the league’s history, teams continue to fill out their rosters, integrate new signings and work on developing the on-field chemistry needed to hit the ground running in March. With the January transfer window still open for another couple of days, clubs still have time to look internationally as well as domestically for players that could make the difference between a spot in the 2019 USL Cup Playoffs and one on the couch come late-October. However, that hasn’t stopped some teams from doing a good bit of business before preseason kicks off. Indy Eleven has arguably had the best offseason of any club in the USL Championship not named Nashville SC, and the addition of Dane Kelly last week was the crowning accomplishment of the club’s roster restructuring. The 27-year-old Jamaican forward is the league’s all-time leading scorer, having netted 67 goals in his regular-season career and five more in the USL Cup Playoffs over stints with the Charleston Battery, Swope Park Rangers, Reno 1868 FC and Richmond Kickers. Kelly’s performances with the Nevada side in 2017 – when he scored 18 goals to earn the Championship’s Golden Boot and Most Valuable Player honors – earned him a shot in Major League Soccer with D.C. United last season but he went on to make just one appearance for the club in 2018. That disappointment – as well as the chance to feature for his country at the 2019 Concacaf Gold Cup – should see Kelly return to the Championship with a point to prove for Head Coach Martin Rennie’s side. Kelly will work to develop a productive partnership with fellow forward newcomer Ilija Ilic (Louisville City FC), who was one of three players in the league to record double-digit goals and assists last season. That should set the table for Kelly to have a big year for the Boys in Blue as the side looks to compete for the Eastern Conference crown. Nashville grabbed many of the headlines this offseason by bringing in 2018 Golden Boot Cameron Lancaster and 20-goal scorer Daniel Rios on MLS contracts but Belmar’s addition to NSC is the most interesting to me because the 26-year-old still has a point to prove. Unlike Lancaster and Rios, Belmar is not guaranteed to make the jump with the club to MLS in 2020 and will need to produce alongside those new attacking pieces to earn a spot on the roster. The former Swope Park Rangers forward certainly has the talent to make that happen, having recorded 25 goals and nine assists in the Championship over the past two seasons. However, a lot of the responsibility for making that front three tick will also fall on the shoulders of Nashville Head Coach Gary Smith, who is hoping the club’s new additions spark a change in its attacking philosophy after the side scored just 42 goals in 34 regular-season games last year. 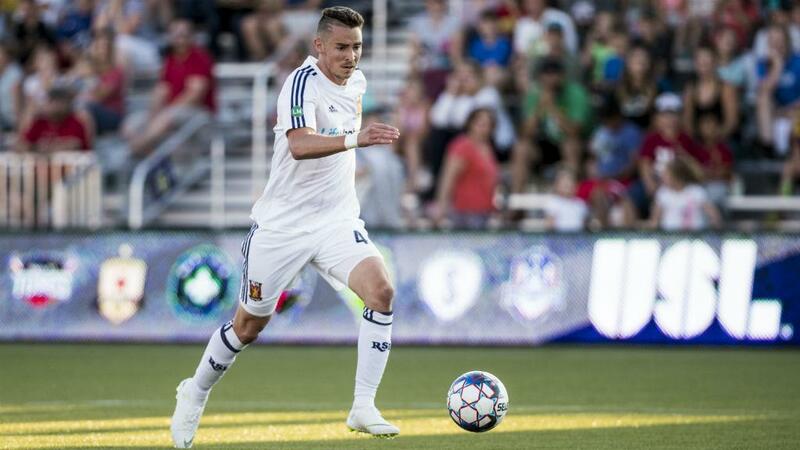 Hoffman isn’t technically an offseason signing – he joined the expansion side on a pre-contract in July – but I’ll allow it because he finished out the 2018 season with Real Monarchs SLC and will be sporting a new shirt this coming March. The 27-year-old Birmingham native ranks third on the league’s all-time scoring list with 59 regular-season goals and has earned All-League First Team selections on two separate occasions (2014 and 2017). Hoffman recorded 17 goals and seven assists for the Monarchs in 2017, helping the club claim the USL Regular Season championship added 12 goals and five assists to his totals this past campaign. In 2019, Hoffman will return to the Eastern Conference – where he spent the 2016 season with Louisville City FC – and lead the line for Head Coach Tom Soehn’s side as it looks to challenge for a spot in the USL Cup Playoffs in its inaugural season. The Tampa Bay Rowdies ranked below the league average in goals scored last season and found a perfect remedy for that in early December with the signing of Brandon Allen. The 25-year-old has scored 40 goals over the past three regular seasons and USL Cup Playoffs, making him the league’s second-highest scorer since the start of the 2016 campaign. Allen, along with fellow newcomer Antoine Hoppenot (Reno 1868 FC), will help fill the attacking void left by Rowdies retirees Georgi Hristov and Joe Cole and the departure of Junior Flemmings to Phoenix Rising FC. Allen also brings a wealth of postseason experience, having helped the New York Red Bulls II claim the USL Cup in 2016 while picking up All-League First Team and Rookie of the Year honors in the process. The prototypical center forward will look to make the most of his opportunities this season and there should be plenty of them after the Rowdies led the league in crosses from open play with 567 last season. Following the retirement of Didier Drogba and the departure of Chris Cortez to Chonburi FC in Thailand, Phoenix Rising FC entered the offseason with a looming hole at center forward. That void has been filled by 6-foot-3 forward Adam Jahn, among others, who will try to help replace the 26 goals that the duo of Drobga and Cortez combined to score over the 2018 regular season and Phoenix’s subsequent run to the USL Cup. The 28-year-old brings a wealth of MLS experience to the Valley, having made over 100 appearances in the league during stints with the San Jose Earthquakes and Columbus Crew SC. Jahn also has Championship experience, having scored three goals in 10 appearances during a loan spell with OKC Energy FC last season. In addition to finding the back of the net, Phoenix will be counting on Jahn to hold up play and distribute to returning wingers Solomon Asante and Jason Johnson as well as newcomers Junior Flemmings, Joey Calistri and Jose Aguinaga, who will look to help Phoenix rise back towards the top of the league’s goalscoring leaders. As legendary Alabama Football Coach Paul Bear Bryant once said, “Offense sells tickets, but defense wins championships.” San Antonio FC will be hoping that proves true this season after bringing in experienced defender Amer Didic from Sporting Kansas City. The 24-year-old from Bosnia and Herzegovina will anchor SAFC’s remodeled back line, which lost defenders Cyprian Hedrick (more on him later) Darnell King and Ryan Felix as well as goalkeeper Diego Restrepo this offseason. Didic will certainly help fill the void after three stalwart seasons with the Swope Park Rangers. The 6-foot-4 center back made 74 regular-season appearances for the Rangers over that span and 10 more in the postseason as the club reached back-to-back USL Cups in 2016 and 2017. Didic earned All-League First Team honors in 2016 – his first season as a professional – and has led the Rangers in clearances each of the past two campaigns with a combined total of 258. Didic’s combination of Championship experience and defensive resolve will be key to Head Coach Darren Powell’s side returning to the postseason in 2019 after just missing out on a spot last season. Ottawa Fury FC had one of the better defensive records in the Championship last season and likely would have worked its way into the Eastern Conference playoff places had it offered more in front of goal. However, the club managed to score just 31 times in 34 regular-season matches, which ranked second-worst among Championship clubs in 2018 ahead of only the Richmond Kickers’ 30 goals. The addition of Francois should see that number increase in 2019 as the forward heads north of the border after a successful season with Pittsburgh Riverhounds SC. The 25-year-old, who brings a direct attacking style from the wing, led Pittsburgh with 62 dribbles completed and 59 chances created in 2018 and contributed four goals and five assists. Francois will look to link up with long-time Fury FC forward Carl Haworth as the club looks to improve on back-to-back 10th-place finishes in the East. Like Ottawa, the Charlotte Independence hovered around the Eastern Conference playoff places last season but unlike its Canadian counterpart, it was the club’s leaky defense that ultimately ended up costing Charlotte a spot in the postseason. The Independence allowed 57 goals last campaign – 10th most in the Championship – but the club started to address that issue this offseason by bringing in 2016 Defender of the Year Finalist and All-League First Team Selection Hugh Roberts. The 26-year-old Maryland native has been a consistent performer in the league since joining the Richmond Kickers in 2014 and has played in the USL Cup Playoffs every year of his professional career. Last season, Roberts started 21 games for Pittsburgh Riverhounds SC, helping the team post a league-best 0.76 goals against average and a third-place finish in the East. New Charlotte Head Coach Jim McGuinness should take comfort in plugging Roberts into the center of defense on opening day as the club begins its quest to return to the USL Cup Playoffs in 2019. Two weeks ago, I told you why I thought New Mexico United could compete for the USL Cup in its inaugural season and Moar is a big part of the reason why I’m sticking to it. The 25-year-old forward played a key creative role in helping Bethlehem Steel FC reach the Eastern Conference Semifinals in 2018, leading the side with nine assists and 51 chances created over 35 appearances. Moar’s ability to take on defenders, set up his teammates and find the back of the net – he scored six goals in each of his two seasons with Bethlehem – add up to an impressive all-around game that increase his chances of fitting in with his new teammates. With the attacking talents of Kevaughn Frater, Devon Sandoval and others around him, I expect to see Moar achieve more success for Head Coach Troy Lesesne’s expansion side this season. Last but not least, we get back around to Cyprian Hedrick, who joined Tulsa Roughnecks FC after two successful seasons with regional rival San Antonio FC. The 29-year-old made just 22 appearances for SAFC in 2018 but finished second on the team with 125 clearances and won 135 duels in the heart of the club’s defense. That type of production will be a welcome sight to a Roughnecks rearguard that conceded 77 goals last campaign, tied with Toronto FC II for the second-most in the Championship. Hedrick, along with fellow defensive additions Renan Ferreira, Luca Lobo, Moses Makinde, Mallan Roberts and Matt Sheldon, should help bring that number down to a reasonable level this season as Tulsa looks to bounce back from a thoroughly disappointing three-win campaign.